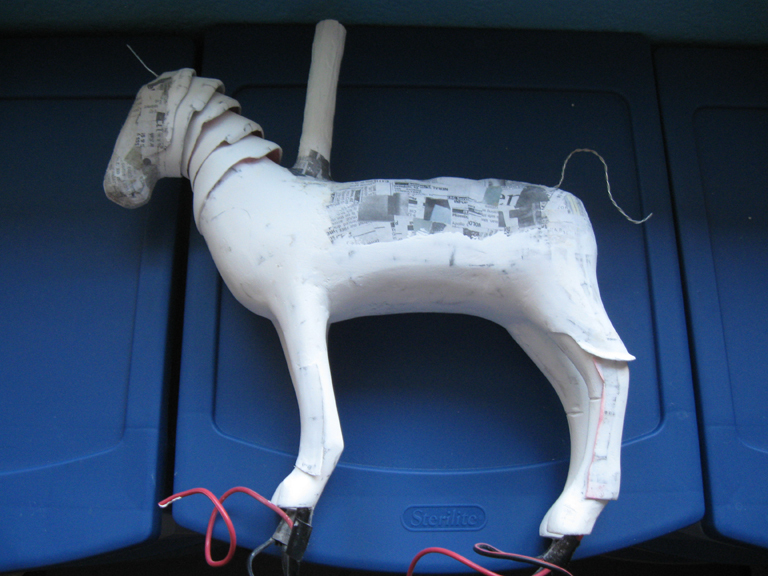 Most of the horse was now spackled, but there were still more pieces to add. David was not convinced that this model would hold up and the spackle would eventually crack. I tested the main body for pliability by squeezing it slightly. Anywhere that seemed weak was reinforced with pieces of wet muslin coated with carpenters glue. Once that dried, it was covered again with a layer of more newspaper. By doing this, I was able to feather the new skin into the older one. A light layer of spackle was applied and later a thick latex primer. Arizona has a small independent film community that relies mainly on volunteers to work on their projects. Last summer, Emmy award winner David Stipes and I met many aspiring filmmakers at Phoenix Comicon. One project that caught David’s attention was the steampunk fantasy, Mantecoza. It centers on the character of Sebastian King, an average office worker, who is suddenly thrust into the neo-Victorian world of Mantecoza, where he struggles to learn how to be a wizard in order to fulfill his destiny. The realm of Mantecoza presents as an alternate steampunk fantasy reality, which the Wizard of Mantecoza accesses by a magic ring. After meeting with the creator, Sue Kaff, and looking over the script, David felt more steampunk qualities could be added to the film. His idea was to build a miniature model of a steam horse for a forced perspective shot. Although the model would only be about 12 inches tall, with the camera close to it the model would appear larger and in scale with the live action background. 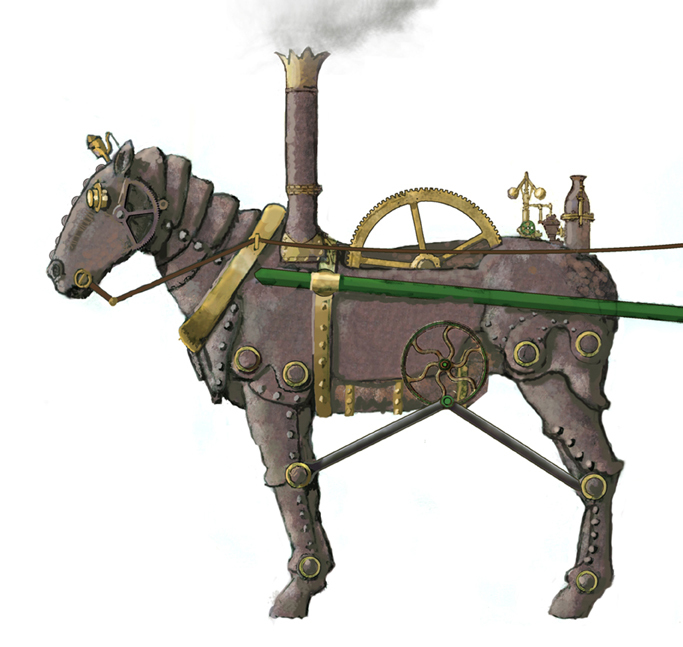 Inspired by Dutch artist, Theo Jansen’s strandbeest, David created a concept design of a horse powered by steam. 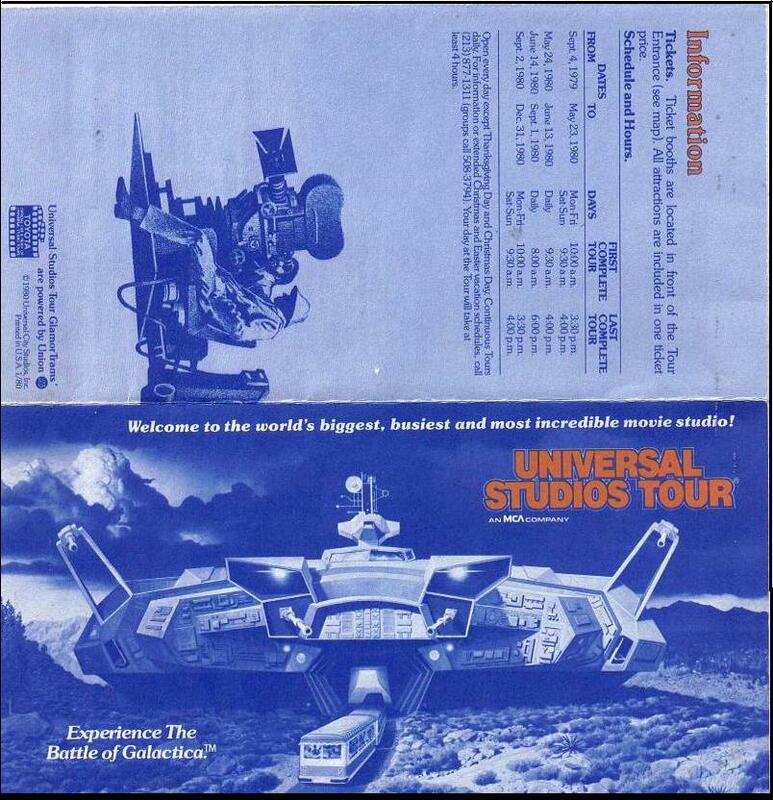 Battlestar Galactica was so popular during the late 1970s that Universal Studios created a special Galactica themed “ride” or event as part of their back-lot tram tours. It was named “The Battle of Galactica” and opened in 1979 and ran to1992.